Dr. Koorhan’s interest in veterinary medicine began as a high school student working in a pet store. In college she attended a class entitled “Veterinary Hospital Practice,” taught at a large veterinary referral practice in Southern California. After completing this course she joined the staff of the hospital, developing her skills as a technician. It soon became clear that a career in veterinary medicine was the path she wanted to take, and from that point on she focused her studies on fulfilling the education and work requirements needed for acceptance into veterinary school. In 1985, Dr. Koorhan was accepted to the University of California at Davis School of Veterinary Medicine. In 1989 she graduated and completed an internship program at Coast Pet Clinic of Hermosa Beach, California. There she furthered her knowledge and experience in the fields of internal medicine, surgery, oncology, emergency and general medicine. 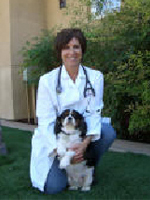 In 1991, Dr. Koorhan and her family opened Doctors Pet Clinic in Murrieta, California. In 2004, doors to a beautiful new building opened allowing her practice of medicine to continue to grow, keeping up with new advances in medicine and technology to ensure the very best for your pet.